Although initial 2001 trials of SRI methods by the Multiple Cropping Center (MCC) at Chiang Mai University were not successful, continued evaluations by MCC, the McKean Rehabilitation Center (see MRC trials) and others led to a national SRI network, which was formalized at a national SRI workshop held in Chiang Mai in May 2003. A February 15, 2005, meeting of the SRI Network in Thailand held at MCC reviewed progress of network members (4 government groups and 9 NGOs and projects). With Thailand Alternative Agriculture Network (AAN) coordination, the SRI Network organized a workshop in June 2005 co-hosted by the Surin Farmers' Support Project (SFS) in the southern section of northeast Thailand. During 2005-2006, Abha Mishra, at the time a PhD student at the Asian Institute of Technology (AIT), wrote successful proposals to the Asia Rice Foundation USA (see resulting journal article) and the CGIAR Challenge Program on Water and Food to support participatory action research with farmer field school groups to evaluate SRI. The CPWF project, undertaken by an AIT team headed by Dr. V. M. Salokhe, introduced SRI through action-research with villages in northeast Thailand (see report on Increasing water use efficiency by using mulch under SRI management practices in Northeast Thailand and video). The 2008 AIT project proposal on Community preparedness for climate change and increased water use efficiency for rice cultivation using principles of System of Rice Intensification (SRI) in central Thailand was selected for the Asia-Pacific Forum for Environment and Development (APFED) Showcase 2008 Programme. The project, which used FFS extension, took place in Ratchaburi Province between 2009 and 2011 (see summary report). A Southeast Asia regional workshop on SRI involving Mekong River Basin (MRB) countries (Cambodia, Laos, Vietnam and Thailand) was organized at Asian Institute of Technology (AIT), Bangkok, Thailand, June 22-23, 2009, in collaboration with the World Bank Institute. During 2011, AIT began a EU-financed regional project, Sustaining and Enhancing the Momentum for Innovation and Learning around the SRI in the Lower Mekong River Basin (SRI-LMB), which is focused rainfed SRI in Cambodia, Laos, Thailand and Vietnam (see project website). During 2012, a thesis and several academic papers were published on SRI (see 2012 updates for summaries). One of these, Rice root growth and physiological responses to SRI water management and implications for crop productivity, won the SAWADA Prize for best paper published in the journal Paddy and Water Environment Engineering for the year 2012. That same year, the SRI-LMB Project was officially launched and the project in Thailand made progress in Uttaradit and Surin Provinces. During 2013 and 2014, the SRI-LMB Project led numerous trainings, workshops and farmer exchanges for project farmers, staff, and country officials in four countries in the Mekong Basin. These are outlined below and on the SRI-LMB website. During Oct./Nov. 2014, several international SRI events were held in Thailand: the Workshop on Small-scale Crop Production Equipment for System of Rice Intensification, held at AIT in Pathumthani on November 1-3, and the Workshop on Building Alliances around SRI and Agro-Ecology, held October 27-28, in Bangna, Bangkok. The 4th International Rice Congress (IRC), which took place October 27-31 in Bangkok, also included a number of oral and poster presentations on SRI as well as an SRI booth. During May 2015, a delegation from Thailand attended the first SE Asia Regional SRI Conference in Malaysia, during which time plans were made to begin a SE Asia SRI Network that will help link SRI efforts in Thailand with SRI initiatives throughout the region. At the close of 2015, more than 5,000 rice farmers in Cambodia, Thailand, Laos and Vietnam have been learning and adapting SRI methods at 172 sites in 32 districts of 11 provinces. A 2016 article by Mishra et al published in AIMS Agriculture and Food document some of the SRI Lower Mekong Basin (SRI-LMB) project successes in Thailand and Cambodia (See item below). The initial calculation of yields has showed an average paddy yield of 5.03 t/ha with SRI-transition, whereas with SRI-demonstration the average yield was 6.41 t/ha. These yields were 60 and 100% higher than the average baseline yield in the region, 3.14 t/ha, for the same farmers and same locales; the economic gains for farmers were found to be higher in rainfed areas when using the new methods. Utilizing the implementing consortia established at local, national and regional level, the SRI- Lower Mekong River Basin (SRI-LMB) Project as of early 2017 involved more than 7,000 farmers on more than 400 action research sites. The project, is also reaching out to another 30,000 farmers through field visits and local workshops in the region. The Thai SRI-LMB experience was reported at the Regional Review and Planning Workshop of the SRI-LMB Project organized in Hanoi, Vietnam on 24-25 April 2017. 3) climate change mitigation -- greenhouse gas emission reduction -- where possible. These indicators were compared with the baseline scenario. [February 17, 2017] Utilizing the implementing consortia established at local, national and regional level, the SRI- Lower Mekong River Basin (SRI-LMB) Project now directly involves more than 7,000 farmers on more than 400 action research sites. The project, is also reaching out to another 30,000 farmers through field visits and local workshops in the region. Farmers are engaged in developing, evaluating and adapting “Climate Smart” crop management practices using SRI agro-ecological principles through setting up of SRI demonstration and SRI learning plots. The government counterparts, who are directly implementing the field activities in Cambodia, Laos, Thailand, and Vietnam, are reporting higher yield, higher net income with reduced input use and greater resilience to extreme weather events. These findings have been reconfirmed by research conducted by national universities in all four countries. The government believes that better increase of crop production with good quality should enable farmers to successfully compete with global market. Some key challenges in the agriculture sector mainly are (a) the and lack of labor for agricultural activist in the near future, (b) low and infertile natural resources and (c) the market instability need to be addressed to make the rainfed production system stable and efficient. [See December 2016 SRI-LMB Newletter for further information, including information on the various workshops throughout the project countries of theLower Mekong River Basin.] Insights gained frorm the project with regard to dealing with uncertainty and mobilizing farmers’ creativity have been compiled by Abha Mishra in her February 2017 article in the Agricultural Research & Technology journal. ECHO Asia in collaboration with Fah Mui Farm organized a two-day "The Northern Thailand SRI Experience: Sharing, Practicing and Niche Marketing" workshop at Fah Mui's farm in Chiang Rai Province, Thailand, on June 8-9, 2016. The workshop included 42 participants from five countries: Thailand, Laos, Singapore, India, and USA. Fifteen farmer representatives from northeastern provinces of Thailand were associated with the SRI Lower Mekong River Basin (SRI-LMB) project being implemented by the Asian Institute of Technology (AIT) in Bangkok. Workshop speakers included Napaphan Jamnan (Fah Mui), a farmer from Chiang Rai who has been successfully practicing SRI for many years; Dr. K. N. Bhatt, a professor from India who shared his experience in India with System of Finger Millet Intensification (SFMI), which is similar to SRI and focuses on finger millet; Dr. Monamorn Preecharattana, a lecturer from Mahidol University who has conducted SRI research in Northeast Thailand and who works as a self-identified ‘Farmer Trainee’; and Dr. Suphathida Aumtong, a professor from Mae Jo University who shared what is being learned from reduced-water rice cultivation research. Several Thai farmers, including Fah Mui, also shared their experiences with adopting SRI. Fah Mui is a northern Thailand farmer who, in addition to her environmentally-friendly rice culture, has created a niche market through her farm and ships the value-added rice all over Thailand. [April 5, 2016] A recent article in AIMS Agriculture and Food records some of the findings from the regional Lower Mekong River Basin (LMB) project, which involves smallholder rice farmers, researchers, extension personnel, and development professionals, together with staff of relevant government ministries. The project objective is to produce healthier and profitable rice crops under rainfed conditions using SRI methods, which are evaluated and refined through farmers’ participatory action research (FPAR). 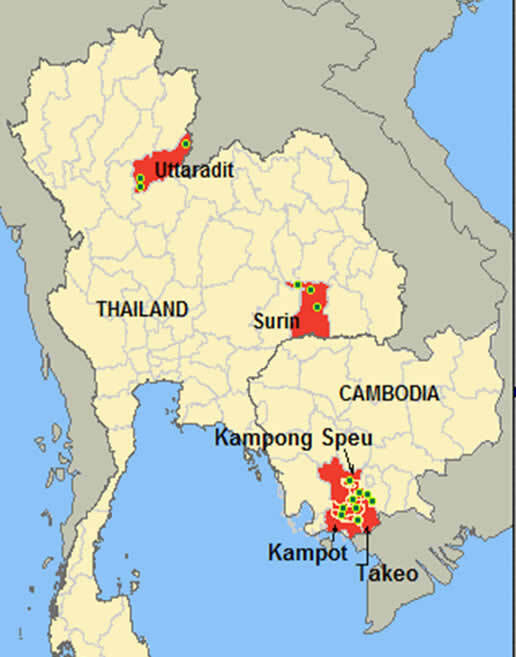 As part of the action-research, more than 120 sets of field experiments have been carried out at 60 FPAR sites in Cambodia and Thailand (see map at right), directly involving 3,600 farmers. The experiments have ranged from the integration of many SRI principles with farmers’ current local practices or improved practices which was termed as "SRI-transition" to full demonstrations and assessments of SRI methodology, i.e., SRI-demonstration. The initial calculation of yields has showed an average paddy yield of 5.03 t/ha with SRI-transition, whereas with SRI-demonstration the average yield was 6.41 t/ha. These yields were 60 and 100% higher than the average baseline yield in the region, 3.14 t/ha, for the same farmers and same locales. Productivity gains (dollars gained/dollars spent per ha) were calculated for both rainfed and irrigated production areas. In comparative terms, the economic gains for farmers were found to be higher in rainfed areas when using the new methods. The paper also addresses the potential of new strategies to promote food security in rainfed areas in the LMB region by managing household and natural resources more productively. [December 1, 2015] Through the SRI-LMB Project spearheaded by the ACISAI Center at the Asian Institute of Technology, more than 5,000 primarily rainfed rice farmers in Cambodia, Thailand, Laos and Vietnam have been learning and adapting SRI methods at 172 sites in 32 districts of 11 provinces this year. According to the December 2015 project newsletter, despite this year's delayed monsoon that was experienced throughout the Lower Mekong River Basin region, the SRI fields were able to cope up with harsh weather vagaries. Small rainfed farmers continued to adopt SRI methods due to better crop production as well as increased tolerance to droughts, pests and diseases. The newsletter (page 5) notes how SRI-grown rice is responding to the epidemic of neck blast (Magnaporthe oryzae) in Kampong Speu Province, Cambodia. Late rains resulted in the delayed transplanting of rice until mid-September. Rainfall continued until the final week creating a very favorable micro-climate in densely planted conventional rice in the farmer's field, with 50 - 70% ear heads showing symptoms (drying off) in farmers' fields. However, in the fields where Farmer's Participatory Action Research (FPAR) and farmers have set up SRI demonstrations with wider-spaced (25 x 25 cm), single seedlings transplanted at 15 days, the disease incidence was only in the range of 20 - 25%. This provided an important learning to rice farmers in the changing dynamics of weather patterns, especially late rainfall and transplanted rice in Kampong Speu province. 1) Efforts to make SRI knowledge and practices available on a wider scale can raise productivity and incomes and in turn can address food insecurity of the broad population of smallholders without further deteriorating the environment. 3) Bringing poor smallholding farmers more directly into the process of economic growth can offer more hope at both micro and macro levels. [May 31, 2015] The Southeast Asia Conference on the System of Rice Intensification (SRI), held May 26-28 in Alor Setar, Malaysia, was attended by four participants from the Thailand: Supisra Arayaphong and Thongdam Phongphichith, who represented the Thai Weekend Farmers Network; Boonsong Thansrithong from ECHO; and Michael Common from Earth Net Foundation. The Thai participants made presentations, participated in various panels and discussion groups, and were present at the side events for SRI equipment development, the SRI Global Research Network, and a meeting on the final day of the conference to begin creating a SE Asia regional SRI network. For the numerous workshops related to the Mekong River Basin (LMB) project, see the project website. The Workshop on Small-scale Crop Production Equipment for System of Rice Intensification, held at AIT in Pathumthani on November 1-3, 2014, was organized at AIT in Pathumthani, Thailand. This event, which had 60 participants from 12 countries, was organized by ACISAI and SRI-Rice. The Workshop on Building Alliances around SRI and Agro-Ecology, held October 27-28, 2014, in Bangna, Bangkok, was sponsored by SRI-Rice and Oxfam. It provided a forum for discussing how respective and collaborative efforts can contribute to the more rapid and effective scaling-up of SRI use around the world. A National Inception and Planning Workshop about the Asian Institute of Technology's 60-month project entitled "Sustaining and Enhancing the Momentum for Innovation and Learning around the System of Rice Intensification (SRI) in the Lower Mekong River Basin" took place on January 29-30, 2014, at the AIT's Conference Center . A Northern Thailand SRI Network was formed during a meeting organized by the ECHO Regional Office and facilitated by Green Net at ISAC (FARM) February, 2010. Thirty participants from 13 organizations from Phrae, Nan, Phayao, and Chiang Mai attended. A Southeast Asia Regional Knowledge Exchange on SRI Producing More with Less Water involving MRB countries (Cambodia, Laos, Vietnam and Thailand) was organized at Asian Institute of Technology, Bangkok, Thailand, June 22-23, 2009, in collaboration with World Bank Institute, Washington DC, followed by a field-visit on 24 June in NE Thailand. A meeting of the SRI Network, organized by MCC/CMU (Multiple Cropping Center), was held at Chiang Mai University, February 15, 2005. A national SRI workshop, held at Chiang Mai University, June 5-6, 2003, was organized by MCC/CMU (Multiple Cropping Center) in cooperation with ISAC, RRAFA and MRC. Deejing, Somkid, and Anuttree Buntor. 2019. Screening and identification of endophytic bacteria from organic red jasmine rice soil. Journal of Agriculture 35(1): 49-60. Mishra, Abha. 2017. Dealing with uncertainty with certain principles, and mobilizing farmers’ creativity for sustainable agriculture intensification that contributes to food security. Agricultural Research and Technology: Open Access Journal 4(1): 1-3. doi: 10.19080/ARTOAJ.2017.04.555629. Arayaphong, Supisra. 2012. Cost - benefit analysis of different rice cropping systems in Thailand. Master's thesis, Uppsala University, Sweden. (60p., 2MB pdf). ECHOAsia. 2016. ECHO Asia organized a Northern Thailand SRI experience workshop, June 2016. SRI-Rice website. Mishra, Abha. 2016. Seeding the way with Systems of Rice Intensification in Cambodia, FAO, Family Farming Platform section, May. 2015. SRI-LMB Network Newsletter. 3:(1) 1-6. June 2015 issue. 2014. Thai 'smart' farmers lead drive to boost production. The Nation. September 14. Li, Zhong. 2012. The system of rice intensification (SRI) is gaining ground in Asia. Thailand Business News, May 15. 2010. Innovative climate friendly rice production in Central Thailand. Greater Mekong Subregion Energy and Environment Network section of the Asian Institute of Technology website. 30 March. The Agricultural Extension Unit at the McKean Rehabilitation Center in Chiang Mai, Thailand, authored a Thai language SRI manual. (A separate English language introduction to the Thai version as well as the Thai version with an English title and author page are also available). Mishra, Abha. 2012. IPM-SRI Practices in Thailand. PowerPoint presented at the National Workshop on Sustainable Rice Production: Revisiting IPM, Universiti Kebangsaan Malaysia, Bangi, Selangor, Malaysia, September 12-13. 38 slides. 15 PowerPoint presentations are available from regional workshop "Southeast Asia Regional Knowledge Exchange on SRI Producing More with Less Water", an event organized at Asian Institute of Technology, Bangkok, Thailand, June 22-24, 2009, in collaboration with World Bank Institute, Washington DC. The Thailand Photo Collection contains pictures obtained from Norman Uphoff and others. The slideshow can be viewed in the summary section at the top of the page. Clicking on the photo showing will enlarge it. If you do not have Flash installed, click here to see individual photos which are made available on Picasa.